Aliens, called Ryxins, have come to Earth. They have been here for over 100 years already. But Humans are having trouble keeping their numbers down. They look like Humans except for a few features and special powers. Earth's Governments are fighting an uphill battle. There is also conflict among the patriarchal Ryxins themselves. Why did someone want Roscoe, a half-blood alien, dead? What secrets do the aliens have? On an island off the coast of New Zealand, Curtis McCoy, Private Investigator, is approached by the beautiful Janux to solve her partner's murder. This is Curtis's first case. He is also a half-blood alien and is grieving over a recent divorce. Amidst the disharmony on Earth as Humans try to deal with the infiltration of the Ryxins, Janux captivates Curtis's attention as he grapples to solve the mystery. In doing so he discovers an underclass of aliens, bred to serve their masters. There is corruption and cruelty which have forced some to fight back in the only way they know how. Genesis Cotterell grew up on the East Coast of the North Island of New Zealand. 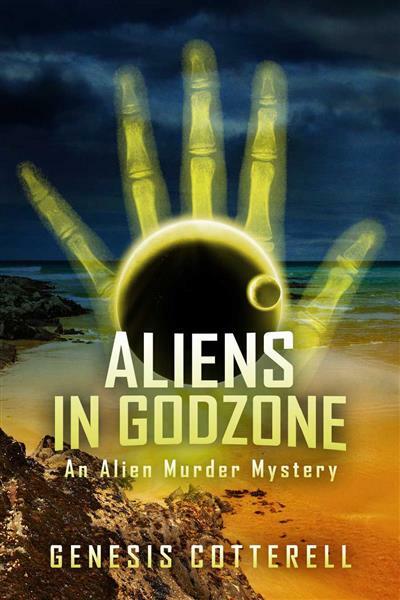 In Aliens in Godzone she tries to imagine what would happen if aliens came to earth and nobody knew about it for some time. When she was sixteen she bought a portable typewriter and learnt to type. She wanted to become a writer but it wasn't until many years later that she began to learn the craft of writing. Genesis lives in Albany with her partner and is currently working on a sequel to Aliens in Godzone.